Used as a houseboat in Holland then scrapped in 1969 at the Ven de Marel shipyard in Ouwerkerk, Holland. 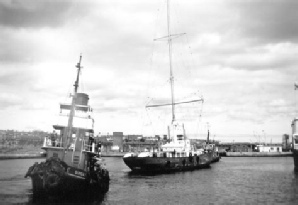 After Radio Scotland closed in August 1967 the Comet was put up for sale in Dunbar Harbour. With no purchasers coming forward she was towed to Methil Harbour, Fife, Scotland where she arrived on 18th September 1967. 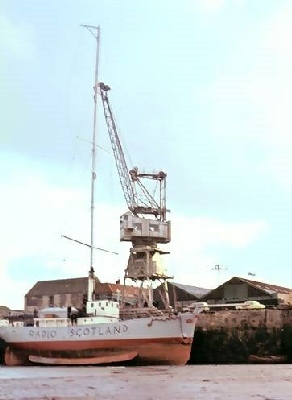 While she was in Methil Harbour all the radio equipment was removed. The vessel was subsequently sold and towed to Vlissingen in Holland where she was used as a houseboat until finally being scrapped in 1969. 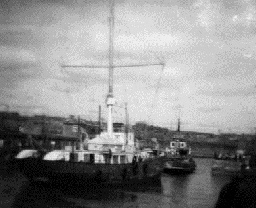 Above right: In Methil Harbour after the radio equipment had been removed - note the aerial mast lying on the quayside. 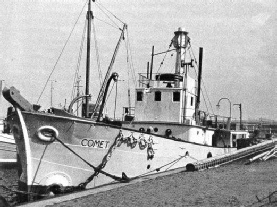 The Comet was formerly an Irish light vessel, based at Daunt Rock, off County Cork, Ireland. The ship achieved fame in 1936 when she was the subject of an heroic rescue by the local lifeboat crew during a ferocious storm. On 7th February 1936 a south-eastern gale, with rain and snow, developed into a hurricane. 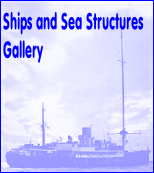 At 8am on 8th February 1936 an SOS was received from the Comet, which had broken from her moorings and was drifting dangerously into major shipping lanes. Without waiting for orders, in horrendous conditions, Coxswain Patrick ("Patsy") Sliney took the Ballycotton lifeboat, Mary Stanford, to sea. 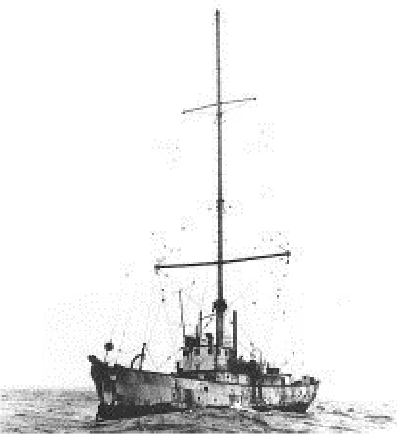 Comet was found riding at anchor a quarter of a mile away from her usual position at Daunt Rock. 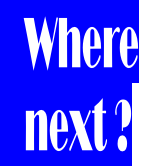 Other ships arrived, but did not approach the Comet in such terrible conditions - the Comet was being tossed around by the waves and if she had hit another ship it would have caused serious damage to both vessels. The Mary Stanford made several attempts to get a steel cable aboard the Comet, but on each occasion crashing waves forced the ships apart and the cable eventually snapped. When darkness fell, Mary Stanford headed for Cobh to get stronger cables, while The Innisfallen and HMS Tenedos stood by the Comet. The Lifeboat crew had been at sea all day, without food. They ate, slept for three hours and received a change of clothing before setting out again early next morning to Daunt Rock. The sea was just as stormy as the previous day, and it was now enveloped by a thick fog, making it impossible to effect a rescue. The lifeboat remained in the storm all day and all night until the Commissioners of Irish Lights vessel Isolda arrived and stood by while Mary Stanford went to Cobh to refuel. The lifeboat returned later in the morning of 10th February 1936. That evening, the storm increased and the Comet drifted closer to Daunt Rock. As darkness approached she was just 60 yards from the rock and the lifeboat Coxswain decided the only option was to try and get alongside and for the crew to jump for the lifeboat - a hugely dangerous operation. On the first attempt, one man got on board, on the second attempt no one jumped; a third time five men reached safety. The lifeboat went in a fourth and fifth time, and again no one was able to make it. Two men were still on board the Comet, clinging to the rails, but too exhausted to jump. On the sixth attempt, as the Mary Stanford came alongside, the two were seized by the lifeboat crew and dragged aboard. The lifeboat, took the rescued men to safety at Cobh and then returned to her station at Ballycotton. Mary Stanford had been away for 79 hours, the crew had only three hours sleep during the 63-hour rescue (from leaving Ballycotton to disembarking Comet's crew at Cobh), and they all suffered from colds, saltwater burns and hunger. A Gold Medal was awarded to Coxswain Patrick Sliney, Silver Medals to Second Coxswain John Lane Walsh and Motor Mechanic Thomas Sliney, and Bronze Medals to Crew Members Michael Coffey Walsh, John Shea Sliney, William Sliney and Thomas Walsh. This rescue became a maritime legend - it was depicted by marine artists and featured in popular books. This rescue was also chosen when a postage stamp was issued by the Irish Post Office in 1974 to commemorate the 150th anniversary of the RNLI - the design based on the painting by Bernard Finnigan Gribble depicting the last two lightship crew being pulled from the Comet onto the lifeboat. 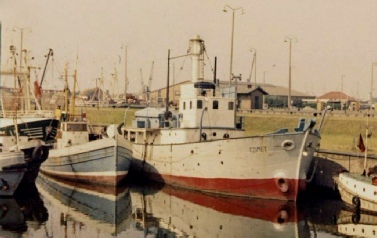 The Daunt Lightship Comet survived and remained in service until shortly before she was sold to Radio Scotland. 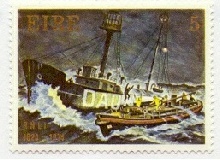 This scene of the rescue of the Daunt Lightship (Comet) crew by the Ballycotton lifeboat Mary Stanford was used on the Irish Post Office stamp issued in 1974.